A rarity until MCA included it among 77 "Horror Greats," the rebranded Universal monster group made available for syndication in 1972 after Screen Gems' fifteen year lease had expired. MCA didn't have Columbia titles that salted the now-retired "Son Of Shock" package, but added most of "weirdies" dating from the 50's, plus The Man Who Reclaimed His Head, largely unseen till '72 even by ardent fans. The cast, plus mention here and there in monster mags, implied chills. 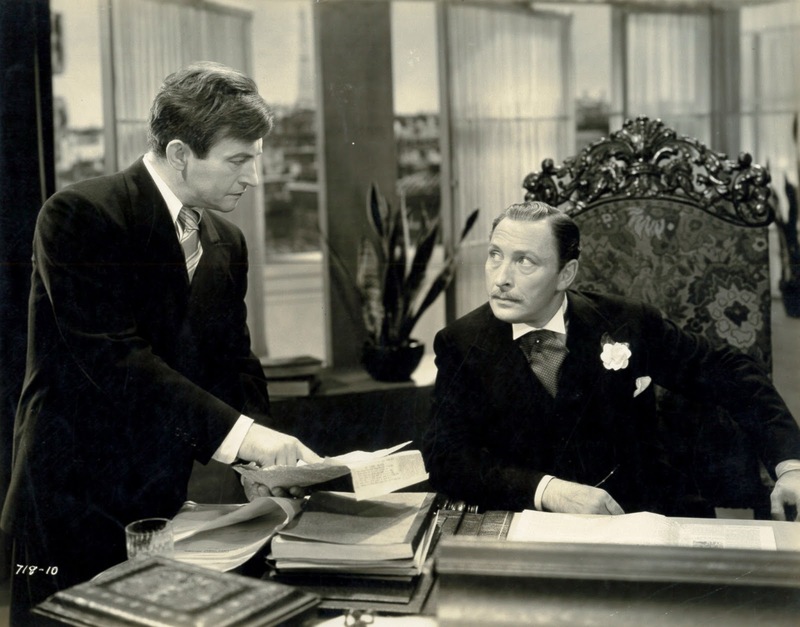 Its title gave promise of a head gone truant from host body, plus there were names of horror pedigree to conjure with --- Claude Rains and Lionel Atwill at lead loggerheads. Certain films can frustrate for coming out of hibernation, only to disappear again, The Man Who Reclaimed His Head gone to us since local stations were done with it. I came across a boot ... no box, label, just a hand-scrawled title on a nondescript DVD. These tend to be wrecks quality-wise, mine quite watchable however, by sheer luck of the draw, with sepia tone that may have been inherent in the 16mm print from which the disc was dubbed. I knew going in that The Man Who Reclaimed His Head was no horror film, so took pleasure in players operating outside the genre, plus content well off beaten path of 30's melodrama. 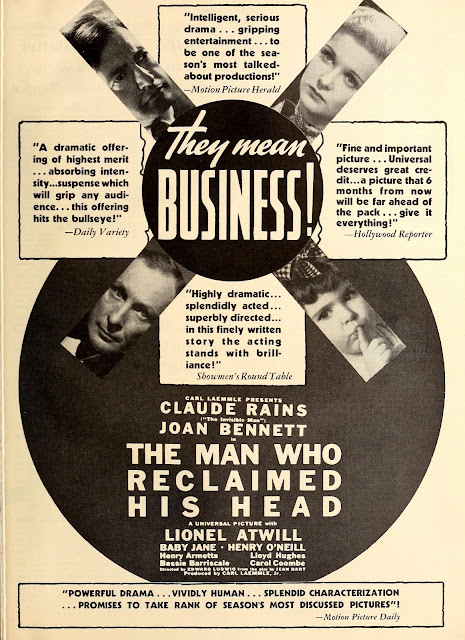 The Man Who Reclaimed His Head proposes war as planned outcome of munitions manufacturers working in concert to pit countries against one another, Rains the pacifist writer who would expose them but for Atwill cunning which extends beyond politics to lust for Joan Bennett, dewy wife of CR and engine to propel be-head that both opens and closes the film. Latter was basis for selling of The Man Who Reclaimed His Head on chill terms. New York's premiere house of horrors the Rialto (ad at right) took a lead in this direction and other showmen followed --- "The Mind Of A Genius Transferred To A Monster," which doesn't make a lot of sense, even where applied to Head's plot situation. Rialto manager Arthur Mayer would have argued How Else to Promote It?, and indeed, how? The Man Who Reclaimed His Head on its own merit was too unknown a quantity, starting with that unwieldy title. Nuggets are here for the finding, though, like arms barons on a yacht mapping a next war and how they'll supply both sides, Atwill their de-facto chairman. Rains dispatching him is a good riddance, enough so for defense attorney Henry O' Neill to promise CR that "no jury" will hand down a conviction, a neat Code sidestep, being assurance that Rains won't answer for "reclaiming" the bad man's head. Interesting to think how hard-to-see films will occasionally play leapfrog. THE MAN WHO RECLAIMED HIS HEAD was readily available in the 70's as you mention (I saw it a couple of times in a late night horror slot) The loose remake STRANGE CONFESSION, though was still under wraps. When the Inner Sanctum box set came out a while back, there was STRANGE CONFESSION but now we can't find the original! In the mid 60s, our family took the Universal Studios Tour. The newest sets on display were a bland residential interior from "Topaz" (used to demonstrate lighting and weather effects) and Witchipoo's castle from "Pufnstuf" (the movie). A locked-up tower in a busy plaza was purportedly used in Charlton Heston's "The Warlord" (hauled back from location?). Bob Hastings of "McHale's Navy" introduced the western stunt show. The souvenir magazine was my first exposure to a number of items I wouldn't get to see for years or even decades: The Sherlock Holmes films, the Green Hornet and Buck Rogers serials, and of course a few pages of Universal Monsters. A still of a smiling Claude Rains talking to a lady was among them; evidently somebody at Universal classed it as horror. Beyond what you wrote today, that's still all I know about "The Man Who Reclaimed His Head". Still one of Raines' most unappreciated movies. I saw RECLAIMED on our local creature feature in 1968 or 1969. Friday nights at midnight. It bored me to tears. I kept looking over at my bed wishing I was under the covers asleep. And it sure ain`t no horror film. 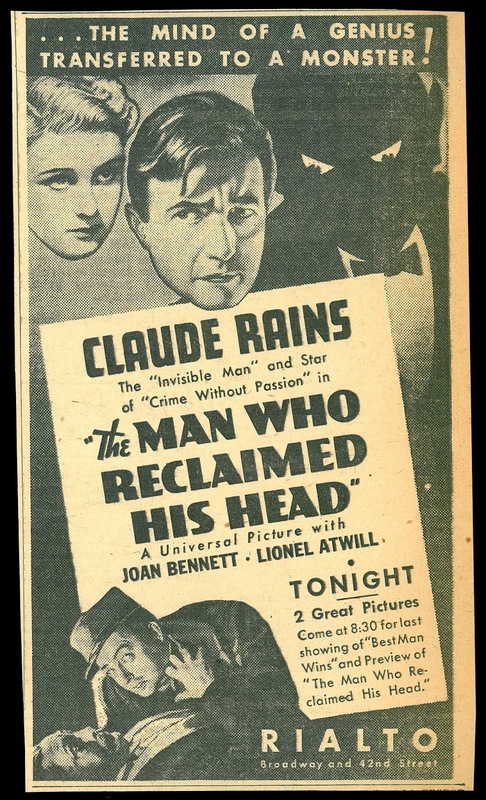 It would be interesting to know the production history of "The Man Who Reclaimed His Head." It was released by Universal Pictures on December 24, 1934, though it was hardly the sort of film you'd think would be suitable as Christmas fare, especially when the title suggested something more in the line of one of the studio's horror pictures. Earlier that year, however, on April 12th, the Special Committee on Investigation of the Munitions Industry was established by the U.S. Senate. Chaired by Sen. Gerald Nye, a Republican from North Dakota, it was known as the Nye Committee. The price of the First World War had been horrendous, in terms of blood and treasure. There had been more than 40 million civilian and military deaths world wide. Of the military forces of the combatants, an estimated 15 to 23 million had died and another 23 million been sick or wounded. The military forces of the United States had suffered lightly in comparison, but even so, 116,000 had died and 320,000 been sick or wounded, most of those in the heavy fighting of the period from July through November, 1918. There was much speculation as to the cause of the war. The national rivalries were obvious enough, but a question was whether there were special interests behind the scenes manipulating the affairs of nations for their own benefit. The question of "cui bono" had an obvious answer in the financiers and munitions manufacturers. Those in the United States had lent Great Britain and France, $2.3 billion prior to 1917, most of it to purchase munitions, but only $27 million to Germany and the other Central Powers. Did they regard this as a bet on the outcome, and did they pressure the administration of Woodrow Wilson into entering the war on the side of the Allies, so that their bet would be covered? That was what the Nye Committee wanted to find out. The stage play from which the film was made opened at the Broadhurst Theater on Broadway on September 8, 1932. 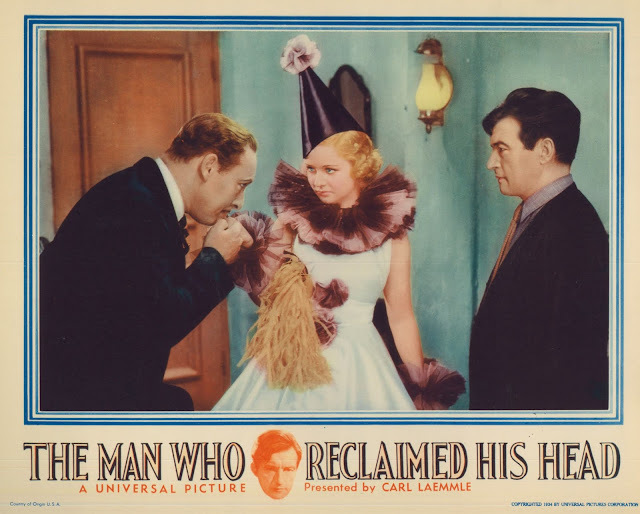 It was written by Jean Bart, the nom de plume of Marie Antoinette de Sarlabous, and starred Claude Raines as Paul Verain, the role he'd later play before the cameras, and Jean Arthur as his wife, Adele, the part that would be played by Joan Bennett in the film. "The Man Who Reclaimed His Head" was not successful as a stage play, running only 28 performances before closing in October. Whether it simply wasn't any good or suffered the poor ticket sales that afflicted most Broadway productions that year, I cannot say. Certainly there was tremendous pressure on closing unsuccessful productions and bringing in new ones. There were 174 plays and musicals offered that year on the Great White Way, most of them no more successful than this one, but a few--"Dinner at Eight," "Counselor at Law," "Gay Divorce," and "Twentieth Century"--would not only be successful on stage but would become successful movies as well. When the Nye Committee was established, however, Universal may have seen an opportunity to exploit the publicity surrounding it. Certainly the "Henry Dumont" character played by Lionel Atwill had obvious parallels with President Woodrow Wilson, as a politician who took the public's trust in him as a man of peace who would lead the country into war, at the behest of the munition manufacturers and financiers. Wilson had won reelection in 1916 with the slogan, "He Kept Us Out of War." His tilt towards the Allies after that caused his Secretary of State, William Jennings Bryan, to resign. The Nye Committee developed convincing evidence of the massive lobbying that was being done by munitions manufacturers and financiers in the United States to turn the President's attention towards helping the Allies. Their financial interest in the outcome has already been noted. The resulting film was dramatically strong but no more successful than the play. Possibly the lack of success was because interest in who was behind the war was intense and deep, but not very broad. The problems facing the country seemed removed from a war that had ended 16 years before, and its resolution of the essential question of who was responsible would bring the people no closer to prosperity. That the question still had political currency, however, was demonstrated when the Democratically-controlled Senate abruptly curtailed funding of the Nye Committee early in 1936, after Sen. Nye indicated that President Wilson had withheld essential information from Congress before obtaining a declaration of war from it against Germany. Nevertheless, the committee's findings lent support to the isolationist movement and the Neutrality Acts of 1935, 1936, 1937, and 1939, which prevented President Roosevelt from actively intervening in what would become the Second World War; that is, until the Japanese attacked Pearl Harbor on December 7, 1941. The irony is that the major players in the earlier war were more deeply embedded by 1941, with a conflict that promised to bring into being what the Henry Luce press called "The American Century." At any rate, it was the massive economic strength of the United States that would win the Second World War, just as it had brought the First World War to an end.